»An Exciting Road Trip from Bangalore to Ooty! An Exciting Road Trip from Bangalore to Ooty! Bangalore is one of the metro cities in India that has residents from various parts of the country. As a good part of them believe that life is outside, travelling is a major activity here during weekends and other holidays. The places that can be easily accessed by road include Ooty, Coonoor, Munnar, Chennai to name a few. Travelling from Bangalore to any of the best tourist places in South India would be a great experience, provided you take the right route and spend the right time at each tourist destination on the way. This road trip is from Bangalore to Ooty which covers a rough 300 km on road. Let's chalk out a few destinations that could be visited on this road trip! The road trip starts from Bangalore city. It is always better to start a journey from Bangalore early morning as the traffic would be much less during these hours. Take the Ring Road which connects with the Bangalore-Mysore highway. The 4 lane state highway is the best road that connects the two cities. If you have any difficulty finding this route, you can ask anyone for Mysore road, and follow the road suggested. Our first halt is in Mysore. Some of the eateries you can explore on the highway are Kamath's near Channapatna(to the left), McDonald's (left), Cafe Coffee Day (left) and Indradhanush (right). All these food joints have their sign boards visible from a considerable distance from them. It takes nearly 3 hours if there is no halt in between the trip. If you would love to explore a bit more on your trip, here is a detailed route from Bangalore to Mysore which takes more than 6 hours to travel to Mysore, covering all the tourist destinations on the way. Exploring Mysore is something you should try on this road trip. Visit the magnificent Mysore Palace that calls for attention as you reach the city, make sure you visit St. Philomena's Church that boasts of Gothic style of architecture. 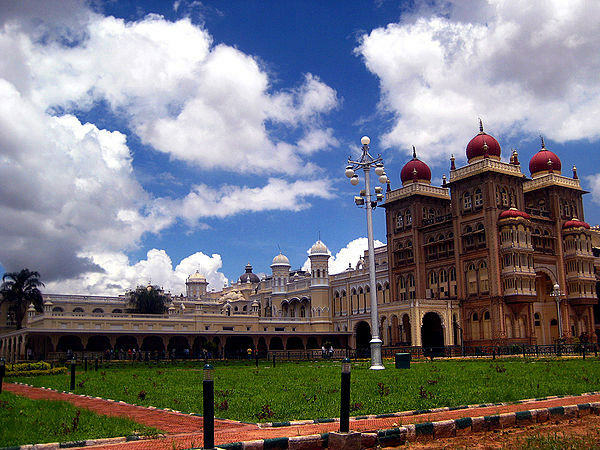 The other attractions of Mysore are listed here. The pilgrimage town of Nanjangud is around 25 km from Mysore, taking NH212. The Nanjundeshwara Temple is worth a visit as the temple is known for its Dravidian architectural style. The temple town is known as 'Dakshina Kashi' or 'Varanasi of the South'. The other attractions at Nanjangud are listed here. The small town of Gundlupet is around 38 km from Nanjangud. You can take NH212, the same road that you took to reach Nanjangud. The sights on either sides of the road make it eventful as you can enjoy the sight of bright sunflower and marigold fields on the route. Gundlupet is known for the Vijayanagara Temple. Other attractions nearby include Parvati Betta and Gopalswamy Betta. Taking the Coimbatore-Ooty-Gundlupet highway, Bandipur is just half an hour away from Gundlupet, covering a distance of around 20km. The jungle safari and the Bandipur Tiger Reserve is what attracts tourists here. The Bandipur safari is conducted at 6.30am and 4.30pm daily. The jungle lodges and other stay options also can be tried for a different experience staying close to wilderness. The Mudumalai National Park is also a known destination for exploring the woods. Mudumalai is just 25km from Bandipur when you continue on the Coimbatore-Ooty-Gundlupet highway. The jungle safari at the National park closes by 9am. The forest has some of the predators like the Bengal Tiger and the Gaur. How about travelling through 36 hairpin bends? You can either take the Coimbatore-Ooty-Gundlupet highway or the hair-raising 36 hairpin bend road to reach Masinagudi. Taking the highway, Masinagudi is 20km away which can be reached in half an hour. The other route is a little longer, yet apt for an adventure freak. Masinagudi is a great birding destination and also a wonderful place for a stay amidst the jungle. Here's another detailed road trip from Bangalore to Masinagudi. Let's head to Ooty. The road to be taken from Masinagudi is MDR700. Ooty is around 30km from Masinagudi, taking less than an hour to reach the destination. Ooty, the Queen of the Hills is also known for its pleasant climate and the gardens, valleys and other attractions worth exploring. Shopping at Ooty for homemade chocolates and wooden artefacts is highly recommended. Here's a road map for your reference.